Communication repair strategies are important for children with hearing loss. Deaf and Hard of Hearing students will often just say "what?" when they don't hear something, or they will not say anything at all. 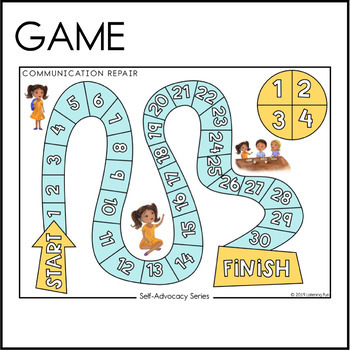 This lesson plan introduces helpful communication repair strategies and many opportunities to practice. Full and Half Size Book: Tells the story of a girl with hearing aids as she encounters several challenging listening situations at school. Sometimes she uses the strategies and sometimes she does not. Jumping off point for discussion. 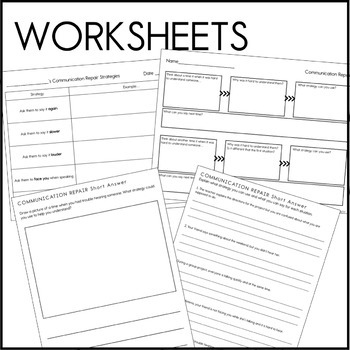 Worksheets: Students write examples from their life where they can use each strategy. Suggested strategies are pre-filled, plus a blank version. Game: Use a paperclip on the spinner and play the game. 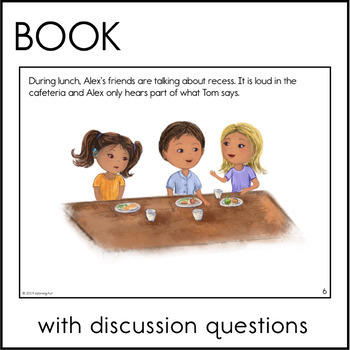 Gives students many different scenarios to discuss. What strategy can you use? Short Answer: Worksheet for writing to demonstrate understanding. 1 upper level with 5 short answer, and 1 lower level where the student draws a picture and writes. Please note: due to nature of illustrations, the book is ONLY available in color. The rest of the sheets are available in black and white. The strategies discussed in this resource are specifically for when you can't hear the other person. 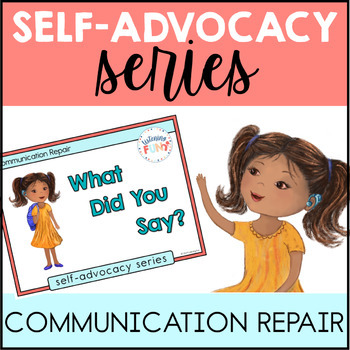 Part of communication repair is adjusting when someone cannot understand you, but that is not addressed in this resource. This focuses mostly on giving deaf and hard of hearing students other options besides "what?!" when they don't hear someone.